Intelligent Dispute ResponsesWin more disputes and achieve higher ROI with customized fight rules, optimized responses, and economic filters. Custom NotificationsMidigator doesn’t sleep, so you can! Set custom triggers to notify you of any chargeback concerns across your entire portfolio. Chargeback Prevention AlertsResolve customer disputes quickly before they become chargebacks. Save fulfillment costs, prevent chargebacks, and improve customer satisfaction. Real-Time Account ReportingEasily consolidate your data into a single dashboard for true transparency across an unlimited number of merchant accounts. In-Depth AnalyticsIdentify the real reasons for transaction disputes and solve issues at their source. 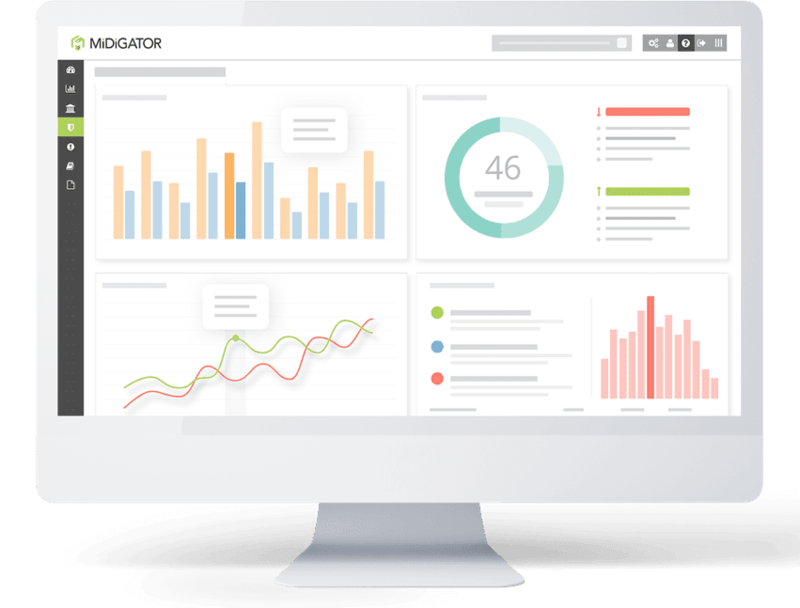 Analyze chargeback and alert data by dozens of metrics. DisputeFlow™DisputeFlow allows merchants to fight chargebacks with just a few clicks, reducing the amount of time spent on responses by at least 62.5%. Prevent Chargebacks & Reduce Payment Processing RiskLearn how to use Midigator to create a comprehensive strategy for preventing and analyzing customer disputes. Fight Chargebacks & Recover More RevenueMidigator uses a highly-successful and technology-driven strategy to automatically fight chargebacks and recover lost revenue. Automate Tasks & Streamline ProcessesLet Midigator remove complexities and improve the efficiency of your chargeback management strategy. BlogRead helpful tips, industry insights, and case studies to create the most effective chargeback management strategy possible. EventsSchedule one-on-one meetings with the Midigator team at an upcoming trade show or event. FAQFind answers to common questions about Midigator’s technology, services, and outcomes. IntegrationsLearn how Midigator establishes direct integrations with other software applications. For DevelopersLeverage Midigator’s API for labor-saving automation and superior results. ROI CalculatorFind out how Midigator’s outcomes compare to your current chargeback management efforts. About MidigatorLearn why we build Midigator and discover what drives us to innovate every day. PressLearn how Midigator’s technology and the hard-working team behind it is impacting the payments industry. CareersView open opportunities to join our innovative, tech-driven team. SecurityReview how Midigator makes your data security and privacy a top priority. ContactConnect with our team to discuss what matters most to your business. Which of These Fraud Tools is Right For Your eCommerce Business? Are you in the market for a fraud tool that can help reduce risk for your online store? If you need help preventing fraud and the resulting chargebacks, we have a helpful list of available options. The following list of fraud tools can help you detect potential fraudsters and block transactions that will likely result in chargebacks. However, there is no single solution that can completely eliminate risk. Fraud tools are typically designed to prevent true criminal fraud, not friendly fraud (illegitimate chargeback requests) or basic customer disputes. Because nothing can account for unscrupulous consumer behavior or misunderstandings, you’ll still receive some chargebacks—no matter how powerful your pre-sale tool is. On the surface, it may seem like you’ll need a lot of different service providers to create a comprehensive risk management strategy. While you do need multi-layer protection, it isn’t as challenging to acquire as it may seem. 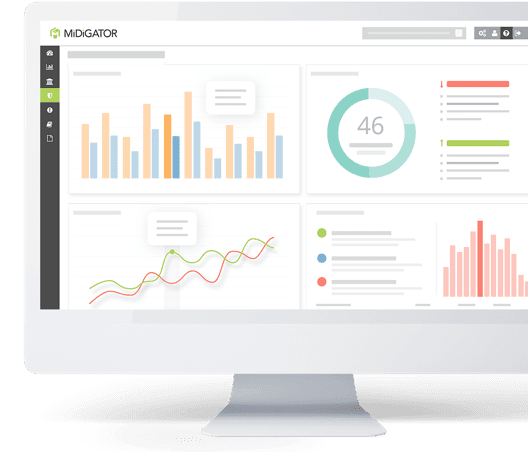 Midigator® is an all-in-one solution—access all the tools you need to prevent and fight chargebacks from a single platform. Choose a pre-sale fraud tool from the list below and Midigator will be the perfect compliment for post-sale chargeback management and prevention. Lastly, some service providers reimburse merchants if they receive a chargeback on an approved transaction (noted in the list below with an asterisk). However, this reimbursement policy usually comes with certain restrictions, meaning merchants won’t be refunded for all the chargebacks they receive. Therefore, you’ll still need a system in place to fight the chargebacks not covered by the guarantee if you want to recover your revenue. Review all profiles in the list below. Or, click a specific vendor’s name to visit their profile. CashShield offers mid-to-large enterprises comprehensive protection against fraud risks, including account takeovers, promo abuse, unauthorized payments, and peer-to-peer transfers. The machine-automated solution functions without the need for any data scientists or fraud analysts, and the algorithm is able to self-learn in real-time. Emailage helps companies reduce online fraud. The predictive online fraud risk score allows companies to assess risk using email address reputation, behavior, and metadata. With Emailage, you get instant access to fraud signals associated with over 50 million unique email addresses connected to IP addresses, domain names, phone numbers, and more. You’ll benefit from this massive network because positive signals from these elements can help you approve more customers and stop more fraud. Emailage help companies fight back against fraudsters, scale into new markets, and focus on what matters: growth. Feedzai provides a powerful decision engine that uses a combination of machine learning, rules, and hyper-granular “Segment of One” profiling to make real-time decisions on any risk or fraud use case–transaction scoring for fraud detection and prevention, anti money laundering, account opening, and much more. As a data-agnostic system, Feedzai’s platform can also work on areas like employee abuse, launch abuse, or account takeover. In summary, Feedzai can be applied to any real-time decision scenario with structured or semi-structured data. Fraud.net is collaborative, AI-powered fraud prevention, currently protecting over 2% of all digital commerce. It combines collective intelligence, dynamic machine learning, and rule-based decision engines to detect fraud in real-time at scale. Fraud.net is a cloud-based system, offering a full and transparent presentation of data, statistics, and contextual variables to help merchants reduce fraud and streamline decision-making processes. Fraud.net works with leading brands in the e-commerce, digital payments and lending, travel, and marketplace sectors. IPQualityScore provides anti-fraud services that cover the whole spectrum of preventive fraud management. Proactively prevent fraud with IPQualityScore’s suite of anti-fraud tools including real-time transaction fraud scoring, proxy & VPN detection, bot detection, device fingerprinting, and email verification services. Detect high-risk users and transactions in real time to prevent chargebacks, fraudulent transactions, and quality issues. Proxy/VPN Detection & IP Filtering: Identify high-risk transactions by detecting proxies, TOR, VPNs, bots, and other high-risk connections that are primarily used to conduct fraudulent activities. Email Verification: Detect invalid email addresses, high-risk emails, or those that belong to a temporary or disposable email service frequently used by fraudsters. Device Fingerprinting: Analyze over 200 data points from a user’s device, as well as transaction details, to determine if a user is intentionally spoofing their identity or exhibiting any patterns of fraudulent behavior. Kount pioneered the use of machine learning in reducing fraud, protecting online businesses, and increasing revenue. Because the company develops and owns the core technology stack, Kount delivers fast, accurate decisions in just a fraction of a second. While sophisticated, Kount was designed to be simple to implement and simple to use for easy fraud detection and dramatic improvements to bottom line profitability. The technology offers protection in every digital interaction: account takeover, account creation, payment transactions, and account login. MaxMind’s minFraud service reduces fraud by providing real-time fraud analysis, post-query alerts, and contextual data to inform manual review, support automated workflows, and aid risk modeling. Integration: Integrates with almost every eCommerce platform either via an app, gateway emulator, or API integration; 10 minute integration for Shopify or other hosted platforms; 2-3 days for custom platforms. NS8 is a multi-layered solution providing advertising and retargeting fraud prevention, transactional fraud protection, and performance monitoring all within a single product. NS8 tracks fraud throughout the lifecycle of a customer, identifying risks for suspect behaviors from ad campaigns all the way to checkout. The solution integrates directly into numerous eCommerce platforms so there is no technical lift needed for most clients–it’s a one-click installation that works right away. Mixes automation and manual reviews to streamline order review process. Monitors websites for issues like certificate expirations, downtime, and display errors. Pindrop is the pioneer in voice fraud prevention and authentication. Pindrop’s multi-factor solutions use every facet of a call–audio, voice, and metadata–to distinguish between fraudulent and legitimate callers. Proprietary technologies are used in combination with machine learning and data from 650 million phone calls per year to provide highly accurate results that help reduce fraud losses and authentication expenses. Pindrop has been selected by the world’s largest banks, insurers, brokers, and retailers, detecting over 80% of fraud, even for attackers never seen before. Phoneprinting™ technology, the heart of Pindrop’s anti-fraud solution, analyzes the audio of a call to help identify malicious behavior and verify legitimate callers. Deep Voice™ biometrics run a friction-free analysis throughout the lifecycle of a call, from IVR to agent, identifying and analyzing repeat callers. Precognitive is a hybrid fraud prevention and cybersecurity company. It’s Decision-AI platform focuses on solving complex fraud threats. Use cases include end-to-end credential stuffing or account takeover prevention, complex card-not-present fraud, and mitigating high-value account creation fraud. The platform monitors visitor interactions of humans and bots over many sessions and constructs a full timeline of events. This helps identify cybercrime attacks at the scouting stage and prevent threats before they start. The technology is industry agnostic, but is geared towards financial institutions, travel, hospitalities, and enterprise eCommerce retailers. Quatrro Processing Services (QPS) provides best-in class, proprietary and non-legacy fraud prevention tool, CNP Secure, to eCommerce merchants. CNP Secure includes an aggregator model and identity protection solution with multiple transactional variables to support merchants with 24/7/365 transaction monitoring. The end-to-end fraud protection solution has been tailor-made to enhance order acceptance rates while combating chargeback. CNP Secure derives fraud score on the basis of Chargeback Propensity Rate (CPR) by analyzing a powerful database, highlighting customer’s behavior and negating the chargeback propensity. CPR comes with a holistic approach to help merchants stop fraud before it happens. Sift Science applies machine learning to prevent all types of online fraud and abuse. Customers leverage the company’s accuracy to automate decisions and use the platform to investigate and report on abuse types such as payment fraud, account takeover, spam, scams, and more. Thirdwatch is an artificial intelligence (AI) driven startup that aims to prevent fraud in eCommerce by providing companies with a vital, technology-enabled solution that flags risky transactions. It uses behavioral analysis, elastic linking, proxy detection, machine learning, device fingerprinting, and more. Thirdwatch’s AI flagship product, ‘Mitra,’ detects fraud on eCommerce platforms in real time by identifying and separating genuine transactions from fraudulent ones. Data Capture and Device Fingerprinting: Our flagship product ‘Mitra’ captures more than 200 parameters to generate unique fingerprints for each and every transaction. Identity Cluster: Thirdwatch matches different endpoints based on each transaction into a cluster and then compares it to the global ecosystem to generate an identity cluster, that shows the real time connectivity of a user. Consumer Trust Score (CTS): Thirdwatch leverages machine learning algorithms, behavioral analysis, and present transaction parameters like cost, shopping area, the device used, payment mode, and more to calculate an accurate Customer Trust Score. Trulioo is dedicated to bolstering the fight against financial crime, fraud, terrorism, and other nefarious activities. Through GlobalGateway, Trulioo’s bank-grade electronic identity verification platform, businesses can instantly verify more than 4.5 billion consumers and 250 million businesses, screen them against international watch lists, and verify them with use of AI technology that analyzes and authenticates ID documents from nearly every country in the world. Whitepages Pro provides global identity verification solutions to help companies identify legitimate customers, prevent fraudulent transactions, and smooth new customer account creation. Pattern recognition, predictive analytics, and machine learning are applied to the five core consumer attributes–email, phone, person, physical address, and IP–to deliver unparalleled coverage and accuracy, all backed by 20 years of sophisticated data science. Zumigo provides authoritative mobile identity and location information to seamlessly verify authentic users while preventing fraudsters from creating fake accounts, stealing user credentials, impersonating valid customers, and completing costly transactions. Founded in 2009, Zumigo is a trusted partner of the largest mobile operators, financial institutions, and retail merchants. Zumigo is backed by some of the leading VC’s including Aligned Partners, Wells Fargo Ventures, Intel Capital, and Capital One Growth Ventures. Mobile identity and location directly from the mobile operator, ensuring the data can’t be spoofed. Suspicious account and phone activity, such as call forwarding activation, number porting and SIM card changes. Proximity and distance between a user’s mobile phone and associated transactions, such as a POS or street address. Don’t see your company listed here? Email details about your services to Contact@Midigator.com — we’d be happy to include you too! How Will the New Mastercard Chargeback Rules Impact Your Business? New Mastercard chargeback rules could have a significant impact on your business. Here’s what you can expect and how you should prepare for changes. A primary goal of Visa Claims Resolution is to generate results quicker. Shortened VCR time frames have distinct benefits, but the new dispute time limits present obvious challenges as well. An easy-to-understand, user-friendly return policy is vitally important. If you want to prevent chargebacks, make it easy for customers to get their money back. If you can’t, the bank will. Midigator is a technology company dedicated to removing the complexity of payment disputes. We believe the challenge of running a business should be delivering great products or services, not managing payment risk. Midigator helps your business get back to business.